Have you purchased a deal from one of those sites like Groupon, Living Social, Eversave, etc? Did you realize that you’re never going to use that 50% coupon for basket weaving classes? Do you want some of that hard earned money back? Have you heard of CoupFlip? 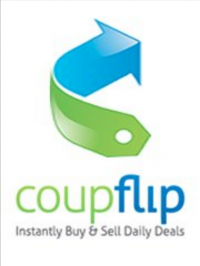 CoupFlip is a marketplace for people to buy and sell deals from “daily deal” (also known as “group buying”) sites such as Groupon and Living Social. On CoupFlip you can buy deals you missed, look for interesting deals in your area, or sell any deal you bought and won’t use. The purchase is immediate – pick the deal, pay, download the voucher instantly and enjoy. Every voucher is guaranteed to be authentic by CoupFlip. For sellers, we provide the opportunity to sell your unwanted deal immediately without the hassle of listing your voucher and praying someone comes along and decides they feel like buying it. For now, CoupFlip is only available in Boston, New York, Chicago, and Washington DC but more cities are on the way. It was only a matter of time before something like this popped up and I’m glad it did! I know how those daily deal emails can cause impulse buying, but now you don’t have to feel guilty! Though I don’t have any unused coupons to sell, I recently purchased a coupon from CoupFlip and the process couldn’t be easier. Choose the deal, pay, and you’re instantly emailed the coupon in PDF form, just as you would be if you bought it straight from Groupon et al. You can print this out and use it immediately. I chose a dinner deal at Diva Bistro in Somerville – an appetizer, two entrees and dessert, a $60 value for $27. It was delicious and this second-hand Groupon was accepted no questions asked. Want to try it out? For a limited time, deals are at an additional 10% off!